The Online Instructional Guide is online and ready for sale. You can click on the link below and you will be re-directed to the store page. Once you purchase the guide you will have life time access to the guide and you will receive a link to register for the live webinar. After the webinar, a recording of the webinar will be added to the guide for those that are unable to attend and for those wanting to review. When you get to the store you will see two courses offered. The e-collar course looks like the picture below. It’s time for forthright discussion about the use and misuse of electric collars (e-collars). The general public has accepted and embraced their use with underground fence systems, and pet owners are picking them up off the shelf to try to eliminate a variety of unwanted behaviors. The use of e-collars is commonplace in some venues, for example, retriever trainers doing field work. Yet in other venues the attitude toward the e-collar is one of complete disdain. Connie’s experiences with e-collars goes back 40 years to a time when they were starting to be used in the field trial game. The rudimentary design was not nearly as sophisticated as the tools we have available today. Connie purchased her first field trial dog in 1995. Since then she has trained five retrievers to a Field or Amateur Field Championship that have also earned Obedience Championships. She has never advocated that an e-collar is necessary to train a competitive obedience dog. However, she would not attempt to train a Field Champion without one. 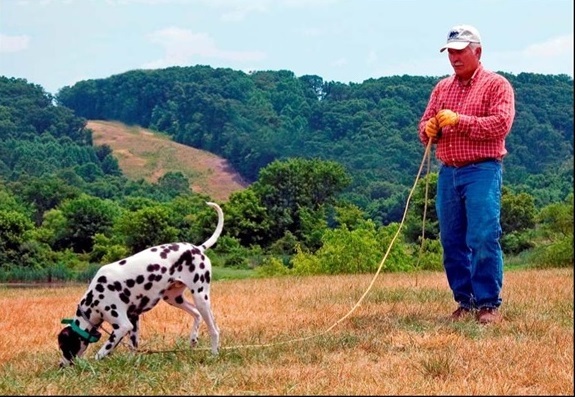 Connie’s husband, Pat Nolan, trained competitive field trial retrievers for 30-years. Now he uses those skills as well as his knowledge of e-collars, to do research and consulting, primarily for the Department of Defense. He also teaches seminars for police, military and retriever sports. What is an Electric Collar? Electric collar is a term used in order to describe a family of training collars that deliver electrical stimulation of varying intensity and duration to the dog via a radio-controlled electronic device. This article is about e-collars that are operated by the trainer, using a transmitter. The trainer controls when the dog feels the electric stimulation by pushing a button on the transmitter. Why would you use an Electric Collar? Whether your goal is to have a well-mannered pet, or a good obedience or agility dog, you may never have a reason to use an e-collar. However, if your lifestyle demands completely reliable off-leash control, or if you have a dog that is frequently unreliable off-leash, the e-collar may be the right tool for you. An e-collar should never be used out of anger or frustration at a dog’s inability to perform. Appropriately using an e-collar involves teaching the dog how to respond to the stimulation. If you are ever going to do anything to your dog that he will find unpleasant, it is your job to teach him how to control it. You must teach your dog how to respond to the stimulation the collar delivers. This needs to be done in a step-by-step fashion that teaches the dog how to stop the stimulation when it occurs and how to prevent the stimulation in the future. Sadly, we live in an impatient world that wants immediate results, whether it is money from the ATM, food at the drive through, or an obedient dog in one training session. It is disturbing to think that any owner would, in his frustration, put an e-collar on a disobedient dog, and simply push the button when he fails to respond to a command. A thoughtful trainer understands that one of the ways a dog learns is by being shown what direction you want him to move. A dog learning how to control e-collar stimulation must be shown how to make it stop and how to prevent it from happening again. Teaching a dog how to control e-collar stimulation does not need to be complicated. Just as your dog has learned how to earn rewards and praise, he can learn how to control the stimulation from the e-collar. Together, Pat and Connie are preparing information for you to discuss the reasons for and against using an e-collar. They will discuss whether it should be used to solve a problem or as part of a complete training program. The difference between enforcing commands and stopping unwanted behavior, and most importantly, how and why using it incorrectly creates backlash. They are planning a webinar on April 24 @ 7:00 pm to discuss the electric collar. What are they? Why are they important to us as dog trainers? The information in this video is a bit incomplete. However, I am using this a starting point for a discussion. I will be working on this discussion in the next couple of posts. Push Pull Training in Drive offers Clear Communication and Conflict-free dog training resulting in a powerful enthusiastic performance from a fully engaged training partner. This video shows a dog working under control with multiple rewards available that is perfectly willing to accept direction and work with me. There is no conflict, he is happy, fully engaged in the training lesson, and yet under tight verbal control. I will be sharing more on how to get the same enthusiastic work and control with your dog. 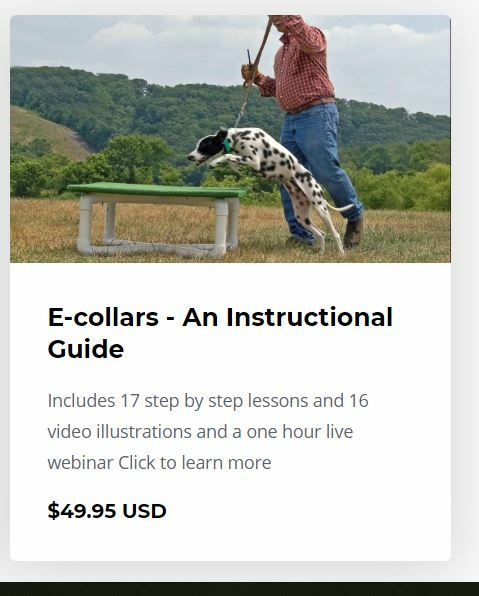 My wife (Connie Cleveland-Nolan) and I are working on an updated e-collar course. I will be posting about our program and progress here. The following is paraphrased from the obedience manual I offer for sale on Amazon. If you have questions or comments about using the e-collar leave a comment below. I’d like to hear from you. Every dog perceives the stimulation from the e-collar slightly differently. To use the e-collar to push for desired behavior you will first you need to find a good starting point for the intensity setting. As training progresses and your dog’s drive state and the distraction level of the environment changes you will need to work up and down on the intensity setting dial to get and keep your dog focused on training. The ideal setting is high enough that your dog notices the e-collar but is not so high that it upsets him. Bring your dog from confinement to your training area. She should be wearing her e-collar and another collar, either a flat buckle or slip-type collar. Attach a 15-foot line to this collar and not the e-collar. Allow your dog to relax and explore her surroundings. With the e-collar on your lowest intensity setting, push the “Nick” button to “tap” your dog. You may see no reaction. Now continue to “tap” at random, increasing the intensity setting each time. Watch carefully, as the first signs that your dog notices the e-collar are usually subtle. When they first feel the e-collar some dogs stop and look up; others may turn to look over their shoulder or shake their head; some sit and scratch at the collar. The most effective intensity setting for teaching with the e-collar is one that is just high enough that your dog notices the e-collar, but not so high that he shows any panic or distress. If panicked by the e-collar stimulation, reduce the setting; if he shows no reaction, increase the setting. This video is 10 or 11 years old. Connie and I are shooting new video now for an online e-collar course. I will be sharing new video clips as we go.